If you are an Internet marketer with any sort of need for tracking with Google Analytics, UTM tags are the way to go. Do not make these mistakes with your UTM tagging! There are some marketers, even large scale marketers, who are completely missing out on the advantages of UTM tagging. When it comes to paid advertising, this is an almost unacceptable mistake. UTM tagging must be done on a consistent basis in order to track the different campaigns that your clickthroughs come from. 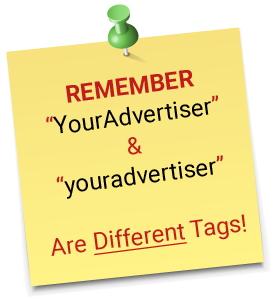 If your paid traffic is tagged as “CPM” or “CPC” or “paid” or “ad” for the same ad channel, it becomes more difficult for you to see the real effect of your advertising. Proper data aggregation comes from consistent tagging. “CPC” and “cpc” are treated as completely different tags, because URL tags have always been case sensitive. Make sure that your company has a standard about when to use uppercase and lowercase letters. In many cases, companies find a great deal of success when they use lowercase letters for medium and source tags. This strategy coincides with the way that Microsoft Bing and Google AdWords auto tag source and medium. There are some parameters that will give you the correct information and some that will not. For instance, if your company is trying to made a distinction between Facebook posts and Facebook ads, just making a separate source will not separate those things in Analytics. You have to know to set the identifier source to “facebook” or “facebook.com.” The other identifiers must be placed in the medium tag in order to have that information viewed correctly in Analytics. Your campaign names need to follow a certain convention in order to be recognized by Google Analytics. They should not be too long – this can cause confusion within the program. If you have many campaigns that start with a similar phrase, you will not be able to see the end of the phrase in the listings, which may cause confusion when you need to differentiate between campaigns. Companies sometimes place UTMs on internal site links that lead to other pages within the same website. This is duplicitous – Google Analytics can do this without the need for a URL tag. This method actually causes the system to lose information on the origination of the traffic. Sub domains are quite common, but if you do not tell the Analytics program that they are from the same website, Analytics will assume they are from different sites. You do not want the program to tell you that clickthroughs from Facebook actually originated from your site. The Google Developer site has plenty of advice to help you avoid this type of situation. Once you have overcome all of the shortcomings of bad UTM tagging, you should look at the advantages of good UTM tagging. If you have the discipline to use a consistent framework, Google Analytics will provide you with some incredible insights that you simply cannot get anywhere else. Tagging your web traffic from paid advertising also allows you to match your data from Analytics with the marketing spend data from your ad channels. Check out our Free Google Analytics Campaign UTM Generator! !